Juicy and flavorful meatballs are so easy with this mixture of beef, bread crumbs, and Parmesan cheese. We used seasoned breadcrumbs in this recipe because we were using the meatballs in a spaghetti sauce, but they would be great with other seasonings if you're making cocktail meatballs or using them in another type of recipe. Use them in pasta sauce, cheese sauce, a stroganoff sauce, or put them in the crockpot with barbecue sauce for a party. Feel free to add a little extra grated Parmesan cheese to the breadcrumb mixture for rolling the shaped mixture. Double this mixture for a large family meal or for serving many guests. Heat oven to 350 F. Line a large jelly roll or a baking or roasting pan with foil and place a cake cooling rack in the pan. Spray the rack lightly with nonstick cooking spray. Combine the ground beef, 1/4 cup of breadcrumbs, Parmesan cheese, salt, pepper, egg, and milk. Mix until ingredients are well blended. Put 3 tablespoons of breadcrumbs in a plate or shallow bowl. 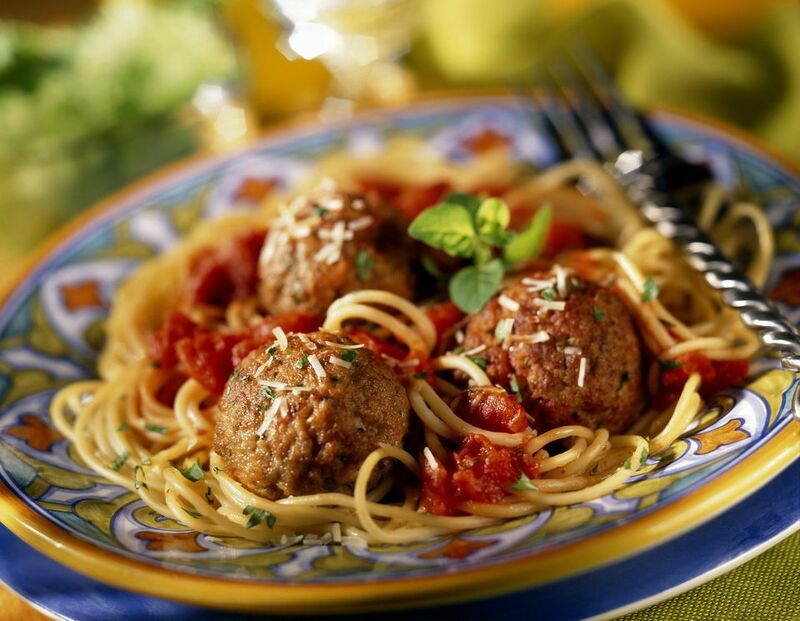 Shape the ground beef mixture into meatballs about 3/4 to 1 ounce in weight or about 1 to 1 1/2 inches in diameter. Roll in the breadcrumbs to coat lightly. Arrange the meatballs on the rack and bake for 30 to 35 minutes, or until they are cooked through and browned. Use a stand mixer with the paddle attachment to mix ground beef for meatloaf or meatballs. Alternatively, put the ingredients in a food storage bag, seal it, and mix it without getting your hands dirty. Blend the meat mixture well but don't overmix or over-work the mixture, or the meatballs might become too packed and dense. Latex or other plastic gloves could also be used to mix meatloaf, and they're a great no-mess, no-stick way to shaping the meatballs. Moistening your hands with a little water as you work also helps to keep the meatball mixture from sticking to your hands. If you don't have a scale to measure the meatballs, roll the meat mixture into long logs about 1 1/2 inches in diameter. Cut the meatballs into 1 1/2-inch lengths and then shape them into balls.